Rice paper wrap filled with steamed Shrimp, Pork, lettuce, bean sprout and Rice noodles. Served with peanut sauce. 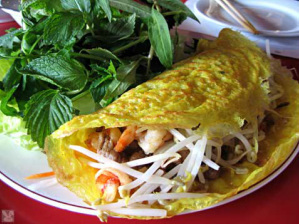 Rice paper wrap filled with choice of Grilled Pork, Beef, Chicken, or Shrimp, lettuce bean sprout and Rice. Pork, carrot, onion, mushroom, and vermicelli wrap and fried. Served with lettuces, cucumber, beansprout, rice noodles and fish sauce. 4A. 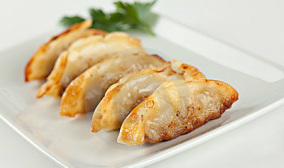 Vegetarian Egg rolls (2) GF - $4.25 Seasonal vegetables, tofu, and vermicelli wrapped and fried. Served with lettuce, cucumber, bean sprout, rice noddles and fish sauce. Cream cheese blended with crab meat and green onion. Chicken and vegetable stewed with perfect tasty, choice of steamed or pan fried. Served with soy bean sauce. 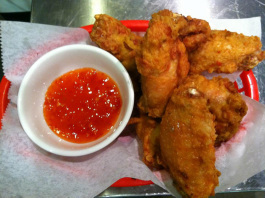 "the chicken wings are crunchy outside, juicy inside and comes with perfect sweet chili sauce." New Zealand green mussels topped with Japanese mayo, Russian Masago, green onion and peanut grilled to perfection. 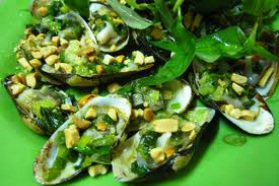 As known as Banh Xeo is a popular street snack in Vietnam, especially in the south. The name means "sound crepe," and it indicates the sound the batter makes when it hits the hot skillet. The shrimp and pork-studded crepe is rolled up in a lead of lettuce and dipped in a flavorful lime-scented sauce before it gets popped in your mouth. Served with a side cart of vegetables, rice papers, and fish sauce. An excellent dish appetizer for 2 people that come with grilled shrimps, egg rolls, and grill pork. Served with a side cart of vegetables, rice papers, rice noodles and fish sauce.